Саундтрек к фильму "Машина любви". 1971 Scepter Records original pressing, made in USA. Раскладывающийся конверт (gatefold), пластинка вставляется в разворот конверта. Tracks: He's Moving On (Theme from The Love Machine) (Main Title), The White Fox, New Threads On Parade, Amanda and Robin In Love, House Party, Part I, Backstage: The Christie Lane Show, Amanda, Love Clown Love, House Party, Part II, Amanda, Amanda, Farewel Amanda, The White Fox Returns, He's Moving On (Theme from The Love Machine). Music by ARTIE BUTLER,. 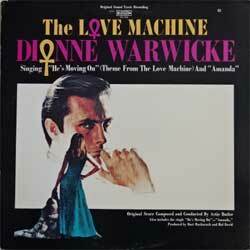 DIONNE WARWICKE - vocals in tracks 1, 7, 10, 13. Состояние винил и конверт отличное-.